Jungle Nausea weren’t around for long, but they did give us this impossibly good six-shooter of a 12″. There are a few decent band histories online HERE and HERE if you’re interested, so I’m going to stick to the music this time around. Two songs into Jungle Nausea, Holly and I were already tracking in the same direction, her commenting that it reminded her of the Lydia Lunch record we listened to recently and me thinking about it in terms of no wave. And given Lunch’s role in that here-today-gone-tomorrow genre, we were both pretty much thinking the same thing. One of the posts I found about the band online used the word “robotic”, and that’s a perfect description of Tammy Cates’ vocals. The jarring aspect of the whole thing is that while the vocals are stilted and deliberate, the music is all over the place. Most of the time it’s like a series of sonic exclamation points, musical laser beams being shot of the speakers. But there’s variety here too. The horns in “What You Know” give the whole thing a futuristic free jazz feel, while the metallic clanging percussion of “Turn Off” feels like it comes straight out of your kitchen and played using spoons as drumsticks and pots and pans the surfaces. 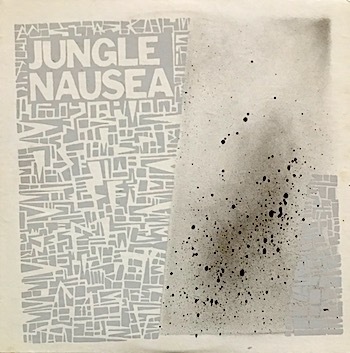 In 2016 Jungle Nausea got the compilation treatment, a twelve-song collection that includes all six tracks from their 1982 release and a half dozen more that hadn’t been published before. Yes, the hand-painted covers of the original are cool, but for the money you might want to stick with the more recent record – you can give it a listen as well as purchase it on Bandcamp HERE. This is a weirdly packaged release. 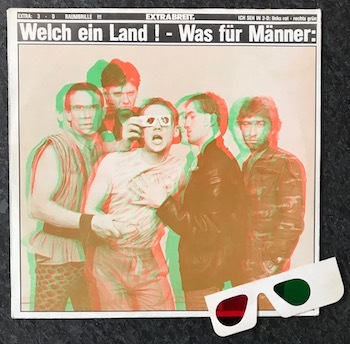 Six Duran Duran remixes pressed onto two vinyl records and housed in a gatefold sleeve, but each record is single sided. And it’s not like there’s any fancy etching on the blank sides. They’re just blank. So why the hell not just put this all onto one record in a regular sleeve? And speaking of the sleeve, what’s up with the cover? I assume this was all done very intentionally, perhaps to give the whole thing the cachet of some kind of underground DJ white label or something. Seems like a lot of extra cost and trouble, though. 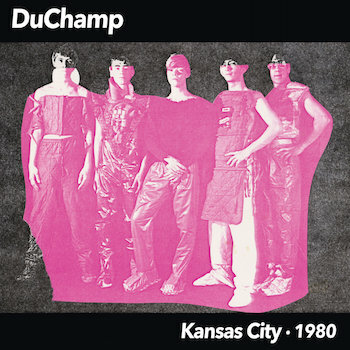 As for the jams, Duran Duran was one of if not my very first musical guilty pleasure – I had a cassette copy of Seven and the Ragged Tiger that I hid in my room, away from my other tapes so none of my metal loving friends would see it and give me crap. That’s just sort of how it was then, or at least it seemed that way in my 12-year-old world. Your musical tastes were one of the things you used to define you, and those tastes legitimately impacted how other kids reacted to and treated you. Dumb? Of course. True? Definitely. But I digress. Duran Duran is one of those bands that lends itself to the remix treatment, and these six cuts sound outstanding on my Rega, clear and bold. 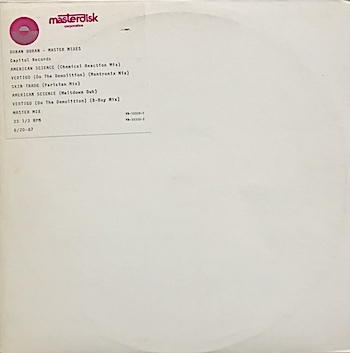 I’m not sure why this thing was put out, but I’m glad it was – if you’re down with 1980s remixes, Master Mixes is definitely for you. I’m currently reading Haruki Murakami’s most recent novel, Killing Commendatore. It’s probably the fifth or sixth of his books I’ve read, and like most of the perennial Nobel Prize short-lister’s works it’s starting to get weird, the protagonist being occasionally visited by a two foot tall, sword carrying personification of the concept of “Idea” that only he can see and converse with (at least so far). Music always plays some kind of role in Murakami’s fiction, which makes sense given that the author himself is a well-known jazz aficionado and vinyl collector (allegedly 10,000 records strong). In fact, prior to becoming a full-time writer he owned a small jazz bar in Tokyo. While the music references in Killing Commendatore have been almost exclusively classical (at least through the first 250 or so pages that I’ve read so far), there are passages about specific compositions, as well as details about various character’s stereo setups. In taking a break from reading this morning, I decided to drop the needle on this newly arrived re-release of Akiko Yano’s 1981 synth-pop milestone Tadaima. This caught my attention because of the involvement of the legendary Ryuichi Sakamoto (♠), and since I love synth-pop I wanted to give it a try. It’s an intriguing piece of work, one that ambles about seemingly at random, but that when you listen carefully exudes intentionality. At times it almost reaches the point of sterility, but then something like unexpected “Taiyo No Onara” comes on and Yano’s voice is allowed to express warmth and wonder. I can’t help but at times to hear traces of dj. flugvél og geimskip in Tadaima, both in the music and the vocals, which is slightly disorienting for me. Regardless, though, this is an enjoyable if somewhat quirky album that still sounds fresh nearly 40 years later. (♠) To this day I can’t hear or see Sakamoto’s name and not immediately think of the scene in High Fidelity when John Cusack catches the skateboarding shoplifters.